ALBANY — New York lawmakers failed to get a new, $175.5 billion state budget in place Sunday night before the start of the new fiscal year at midnight, though legislators believe their $10,000 pay hike scheduled for next year will still happen because the budget is being adopted in a "timely" manner. The Assembly finished the final budget bill shortly after 7 a.m. Monday, and the Senate wrapped up its session several hours before sunrise. In what was billed as an austere year, lawmakers OK'd last-minute pay raises to Gov. Andrew M. Cuomo and Lt. Gov. Kathy Hochul. The Senate approved the resolution overnight and the Assembly did so as its final act before it adjourned this morning. Cuomo will see his salary, now $179,000, rise to $200,000, retroactive to last Jan. 1. In two years, it will hit $250,000. Hochul in two years will have a salary of $220,000, up from $151,500 now. A state pay commission recommended raises for lawmakers, which they got automatically in January, but said a separate resolution – which Cuomo will not have to sign – was needed to give raises to Cuomo and Hochul. The pay hike deal came together overnight with no public discussion of the issue in advance. 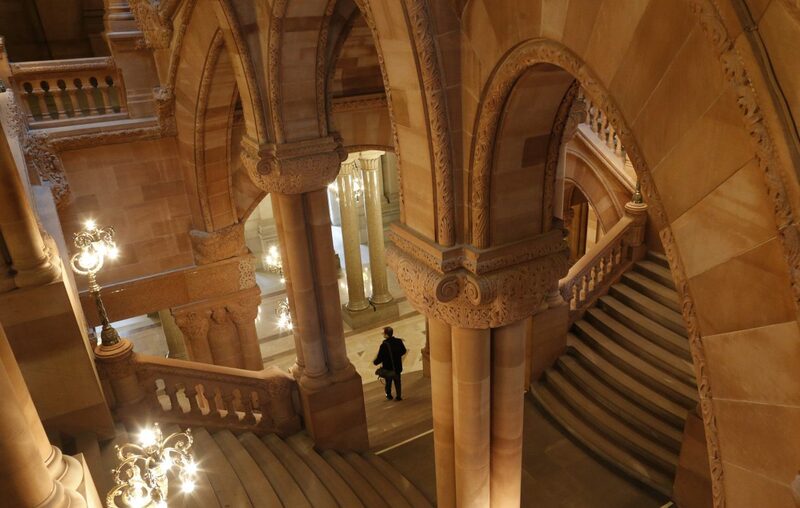 The Legislature in the past has been criticized for adopting budgets while New Yorkers slept. The new, all-Democratic Legislature this year did not break with that tradition. "This is not what we meant when we said we should pass a budget in the light of day,'' Assemblyman Ed Ra, a Long Island Republican, said moments after sunrise in Albany Monday morning. The budget provides the same funding level increase to public schools as last year’s budget — about $1 billion more — and raises revenues to help fund a big downstate transit infrastructure project by instituting taxes on the wealthy selling residences in New York City and an internet sales tax on third party sales on sites like Etsy and eBay. A lucrative tax credit program for the film industry — touted as a job creator by backers and as corporate welfare by critics — will be extended for two years. A new excise tax on opioid distributors and manufacturers can, as explicitly outlined in one budget bill, be passed along to consumers. Critics say the tax will hurt patients legitimately using opioids for pain management. There will also be higher taxes on vapor products and upstate car rentals. "This is probably the broadest, most sweeping state plan that we have done,'' Cuomo said Sunday evening. The budget leans decidedly to the political left, a reflection of the new all-Democratic control of the Legislature after the GOP lost its hold on the Senate in last November’s elections, a development that also gives New York City Democrats a dominant voice in both houses. The budget included some non-fiscal items, like a number of major criminal justice changes so that, under one provision, 90 percent of people arrested each year in New York will no longer have to post cash bail to remain out of jail while their cases proceed; new rules will also go into effect to ensure more speedy criminal trials and require prosecutors to more timely share discovery information with defense lawyers. On the overall budget, Heastie, in a speech shortly after 7 a.m. Monday, addressed the compromises Assembly Democrats had to make on a long list of issues in order to get a spending plan in place. "This is not a great budget. There's not a lot of happiness in this budget,'' Heastie told his colleagues on the floor Monday morning. With other criminal code changes, like restricting public release of mugshots and new sentencing rules for undocumented immigrants to avoid automatic deportation, Senate Republican Leader John Flanagan had a different view. “I totally believe this is a criminal’s bill of rights,’’ he said Sunday before voting began. The final budget will also include $27 million to fund an effort — passed by lawmakers in January — to provide state financial aid for college to undocumented immigrants. A separate effort to let such immigrants obtain New York drivers licenses is not part of the budget deal. During budget debates in the two houses, the rhetoric sounded familiar. Republicans sought to portray Democrats as free-wheeling spenders addicted to tax hikes. Sen. James Seward, the top Republican on the Senate Finance Committee, checked off New York’s upstate population problems and the state’s high tax levels. “As I look at this overall budget, the bad … far outweighs the good,’’ Seward said. Democrats defended the fiscal integrity of the plan and said it follows through on many social justice, environmental and infrastructure promises they have made. “I’m very proud to be able to vote yes,’’ Sen. Liz Krueger, a Manhattan Democrat who chairs the Finance Committee, said after debate wrapped up on one of the budget bills containing a plastic bag ban and other environmental provisions. The budget’s last major deal — involving campaign financing — came together Saturday night. Instead of immediately enacting a system in which taxpayer money would help fund political campaigns in New York, a study commission will be created. It is to report back on such a finance system and other election-related matters by Dec. 1. The panel’s ideas become law unless the Legislature rejects them. Officials say the finance system won't be in place, if enacted, until 2020. They've vowed $100 million in annual spending, though Heastie estimated it would cost four times that amount. Either way, the current Legislature can't box in future sessions of the Legislature with spending demands that are still years away. The study panel will have nine members: two appointed by the governor, two apiece by the Senate majority leader and Assembly speaker, and one each by the minority leaders of the two houses. The ninth member will be selected jointly by the governor and two leaders of the Legislature. The panel will not come to life until that ninth member is chosen. 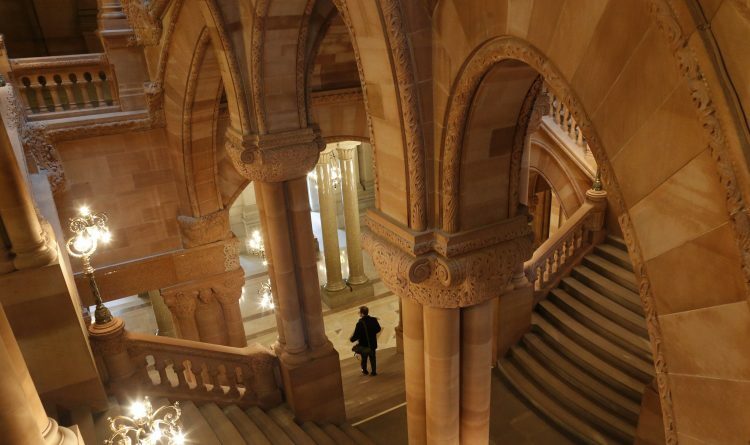 Cuomo and lawmakers also settled on how many upstate prisons will close: up to three. Which ones will be up to the governor at some point this year. The budget includes a lot — the precise number is unknown — of what legislators like to call “member items,” but which the public more commonly calls pork barrel spending. Cuomo will, like all governors, get his share, too, to deliver over the next year of ribbon cuttings and funding announcements. There’s $100,000 to help Canisius College help pay for costs associated with the upcoming NCAA Frozen Four hockey tournament in Buffalo. Money will flow to local chambers of commerce, senior centers, legal agencies that provide services for poor people, and to foster volunteerism in New York. One such bill where many of those items are found stretches nearly 1,200 pages. Money will go to various agricultural sectors, from apple growers to everyone from farmers who grow Christmas trees to maple syrup operators. As always, none of the pork money goes out the door unless approved by the Cuomo administration’s budget director — an illustration about which branch of government ultimately holds the purse strings to decide when, and if, the money is spent. One pot contains $45 million for various arts organizations around the state, without naming them. There is money for sick leave for people still suffering the effects of the 2001 World Trade Center bombing and cash to help create hubs where firms making video games might locate. But the real money is in education and health care, the chief drivers of the budget each year. The portion of the budget paid for chiefly by state taxes will total $102.1 billion this year; state aid to 700 public school districts will total $27.9 billion. The spending hikes come at a time when Cuomo and lawmakers have been warning that the state is facing a sharp drop in income tax receipts, which are a key source of funding for the budget. If there is actual fiscal pain in the budget, it will take time for some of it to be rooted out. Schools did not get the funding levels they say is needed and the final number comes $600 million below what lawmakers proposed just a couple weeks ago. Human service providers, who provide care on the state’s behalf, fought intensely, and lost, for a cost-of-living wage adjustment for their workers. Further, the Legislature has given authority to Cuomo’s budget division to cut up to $190 million from the new budget if tax receipts during the busy tax month of April do not improve. They started falling off last December amid several competing explanations. Much of the budget’s newsier items have been previously reported: a ban on single-use plastic bags, a new toll system for vehicles entering much of Manhattan and a $100 million capital plan to help fix deteriorating conditions on the Buffalo area’s Metro Rail system. As plastic bag ban looms in New York State, shoppers wonder: Now what? Items that died in budget talks included Cuomo’s plan to expand the state’s nickel bottle redemption program to include most non-alcoholic beverages, such as sports drinks and fruit juices. Some groups, like counties, said Cuomo’s plan did not go far enough and should have included glass containers holding wine and liquor. Also not done in the budget was a plan to raise the purchase age of tobacco products to 21 and a Cuomo effort, sharply criticized by business groups, to expand the state’s prevailing wage rate to be paid by contractors doing work on projects with public funds. Passage of the budget had to be completed by Sunday if legislators were to avoid losing a 9 percent pay hike next year. After much wrangling over policy and finances, debate on the plastic bag ban generated one curious back-and-forth Sunday. Sen. Rich Funke, a Rochester-area Republican, asked a series of questions of the measure’s sponsor, Sen. Todd Kaminsky, a Long Island Democrat. He wanted to know if people could bring any leftover plastic bags from home to a supermarket to use once the bag ban takes effect next year. “If I have old Wegmans bags?” Funke asked. “Did you say ‘old, white man’s bags?’ ’’ Kaminsky responded. “I didn’t know what that was,’’ Nassau County’s Kaminsky said of the upstate supermarket giant.